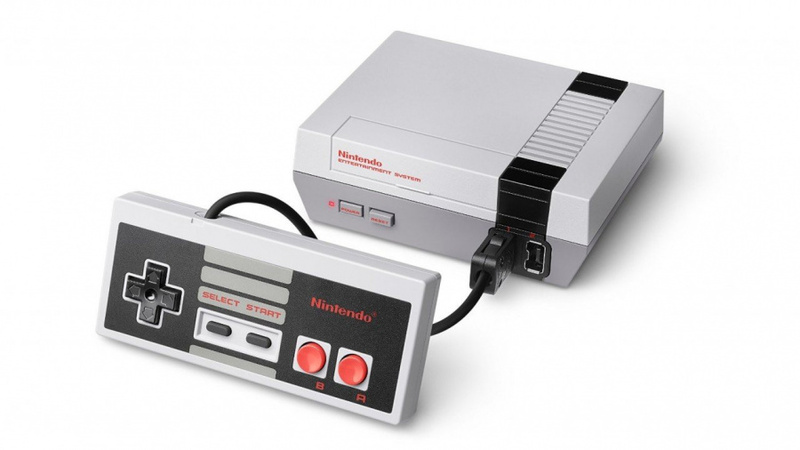 We suspect that many that own a Nintendo Entertainment System: NES Classic Edition (Nintendo Classic Mini: Nintendo Entertainment System in Europe) will have fallen in love with it, but it has some flaws. One of these is the incredibly short controller cable; putting aside the retro 'realism' of wired controllers in this day and age (a weird argument for a tiny box running ROMs), the cables on the accompanying controllers are about as short as is feasible. Ultimately you'll need to be sitting very close to the little system to play it. A post on Reddit has tried to break down why the cable is so short, and has focused on the controller being - in essence - a Classic Controller that can be plugged into Wii Remotes, as seen by the port it uses. The post by 'emuboy85' focuses on the cable and technology in the Nunchuk, primarily how it communicates signals such as button presses and control inputs. It's the 'communication protocol' used, the theory goes, that means cables for the Nunchuk and Classic Controllers need to be short (especially when keeping costs low). The communication protocol used is I2C , this protocol was designed in 1982 by Phillips (now NXP) and was designed for "high speed" chip to chip communication, it does have some limit for the actual standards , first is the speed, second is the length, according to this the length of the NES mini/Nunchuck is right 50pF , which is the maximum you can get from a yet-flexible cable. So, why they didn't make a thicker cable? Because would have been more expensive and less practical. And what about the extension cables? The probably works but are pushing the limit of the protocol, you probably get some communication errors but you don't notice them while you are playing. Why Nintendo didn't use another communication protocol? Because otherwise they would had to make a new set of controllers just for the mini, not compatible with the wii and wii u which is an expensive procedure, design and manufacture the connector itself is really expensive and the NES mini is a small product for Nintendo. It seems feasible, though the NES Mini controller could have had a longer cable. We compared our NES Mini pad with a Nunchuk and a Super NES Classic Controller (an old Club Nintendo reward) - both the older controllers have a slightly longer cable. So even if this theory is 100% correct, which it may be, the NES Mini controller could have still had a little more length in the cable. It's an interesting theory, in any case. Let us know what you think in the comments. Glad they went with the cheaper option. At least this allowed them to produce and ship an excess of NES Mini units and now all the store shelves are overflowing, so anyone who wants it can easily go buy one without having to mortgage their home. The mini NES is dirt cheap for Nintendo to make. They're already charging an exorbitant price for it. They'd still be making plenty of money if they'd just spend a little bit on the cables. I'm going to be using 2 6 foot controller extension cables plus the Wii Classic Controller Pro to negate hitting the reset button on the unit itself and so the unit can sit beside the TV while I play at a comfortable distance. It'll be interesting to see how they perform if my order ever gets processed by Zavvi. Which adds complication and expense to the consumer. Good job Nintendo. My theory is that they don't want people tripping up on them or using them like skipping ropes when they inevitably plug one of these bad boys in to a Wiimote. Lol yeah as @memoryman3 says, money. Boils down to old old tech from 1982, costs nothing. Saves Nintendo millions in controllers. And also, makes you feel like a GIANT with the nes mini overall. The cords I think are pretty ridiculous and make for very complicated set ups. That being said we have gotten a lot of fun out of the little box already. Me on my work trips playing Zelda, my wife and I playing Dr. Mario until midnight, and days like today that I got to play Tecmo Bowl for a few hours with my uncle, cousins, and other family during Thanksgiving. A lot of good in it, despite the obvious flaw with the cord legth. @davidevoid Yeah that's true. I just wish if that were the case that the priority would have been the console it came with. Odd design but I guess they have some sort of reason. But options are good. Why don't Nintendo just explain why it is short for themselves and provide an extension cable option out of the box? @memoryman3 um..classic <every company ever at all points in time>?! Good thing we don't have that scenario to worry about. I got the famicom mini inported, want to complain about short cables? The Famicom Mini are SO SHORT and can't disconnect. Nostalgia over function. I'm still a happy camper. Is it shorter than the classic controller? If so, that theory falls apart. I could always twisty-tie a long cord. I can not make a short cord longer. Maybe one of the Joy-Con swap-able controllers will have a Wii connection port so controllers, like the NES Classic mini, can be used with Nintendo Switch virtual console games. Having a short cable would make sense in that case. I don't see why they needed to maintain compatibility with the Wiimote... there's no sign of the controller being compatible with the Switch, so it's probably at the end of it's lifespan, and I doubt many people would get one of these controllers just to use it with a Wiimote. Here's another theory: someone who makes decisions at Nintendo got drunk and decided to have a "measuring contest", then felt like they had to compensate by making the cable MUCH shorter than normal. When they woke up the next morning, everyone was confused why the cable was so damn short, but no one objected to it... Because of BS "practical reasons" to cover up the true story. What about the theory on the short supply of nes mini Classico??? Do that next. @JHDK <- this guy right here wins the comment thread. Shut it down now because nothing else matters. My theory of why the wire for NES Classic controller for that plug and play is so short is probably because at one point in time Nintendo probably was making it for the Wii remote just like the Super Famicom Wii Classic controller from Club Nintendo. Nintendo probably made a whole warehouse of them then found out that nobody is buying the Wii anymore so probably is a good idea to just make a new plug and play and sold them all away with it. That's just my guess but it would had make sense. I mean there's no point in making anything related to the Wii anymore unless Nintendo is liquidating the Wii accessories. Also that may eventually solve the case as to why Nintendo didn't put a "Home" or "Menu" button on the NES Classic controller as perhaps that controller was never meant to be use with the NES Classic Edition to begin with cause if that is the case they could had easily put them button in there just like the Wii Classic Controller Pro and Wii U Pro Controller. The NES Mini is very popular. The theory sounds plausible, though I'm surprised they would greenlight a protocol that can barely span a ruler's length. Anyway, you shot yourself in the foot Nintendo. I was going to buy it day one, but the controller length was a dealbreaker for me. 1: Nostalgia. Force people to huddle around the TV just like they did when they were kids. We all did this. 2: Japan. Yeah, in Japan, the households are not designed the same. They're kinda smaller, and the size of the cable isn't an issue. It wouldn't be the first time that we rest-of-the-world gamers have to endure something that was meant for Japan only. It's short so people will buy a Wii U and use the controllers for downloaded NES games. I've had many girls over to my place and let them play with my Mini and haven't gotten one complaint yet about the length of the cord. @memoryman3 It's either use the same technology they've been using for 10 years or develop new technology and make the NES Classic cost more. Really, while Nintendo had to make a sacrifice on the cable length, it was a good decision on their part. Yeah, it's a deal breaker for me too. I don't care for the reasoning behind the short cable. Whether it be good sense or foolery. The short cable makes it impractical for me and that what matters from a personal perspective. To each his own opinion. My guess is Nintendo repurposed and reused the cords from unsold Classic Controller/Pros. Would make sense that they had to take a bit of length out to repurpose the cords internal connection to the controller. "but HEY! That's just a theory. A GAME theory! Thanks for watching!" Here's my theory: To cut costs! What is this, a console for ants!? @Kosmo - If the cable length was for nostalgia and to make people huddle around a TV, why not make it the same length as the original NES cable? The Retro Sega Genesis (the one that has 80 games built in, 2x wireless controllers and a slot to play regular Genesis games) is $40 in stores...10 more than the mini and that has wireless controllers...two to be exact, so there was no reason that nintendo couldn't make the controllers wireless and still not have it cost too much. Other than that, I'm glad I still have my original NES and all the games for it (including all of the ones that are on the MINI), so I don't really have to worry about purchasing this...but, I probably will, just like I did with the Retro Genesis (yup, already have a Genesis and a ton of games, just wanted the retro one). In an honest case, yeah, they're shorter cables, but it doesn't mean you still won't get the love out of it. It's retro, and most people didn't own large screen TV's or HD Tv's back in the NES' day...and the Atari had short cables for that system. I don't own the Mini, but if the cable is long in the back that connects it to the TV, then it should be fine...that was how the Atari was...long enough to pull closer to you and play while sitting on the floor. Great, now I'm missing my youth days....now I'll find myself pulling out my Atari and NES to replay again!!!! @KrakenSoup Love the Zoolander pun!!!! "first is the speed, second is the length, according to this the length of the NES mini/Nunchuck is right 50pF , which is the maximum you can get from a yet-flexible cable." This is so full of fail. Um, last I checked 50pF was a measure of capacitance, 50 trillionths of a Farad, not length, which would be measured in millimeters or meters. You really can't even call this a theory without any knowledge of the internal workings or components of the NES mini. Many factors determine cable length with any electronic device and I2C by no means is limited to a meter length cable. Well, that's a terrible reason for making the controller cable so short on the NES Classic Edition/Mini imo. I'd rather have the controller be a decent length for the actual machine it's supposed to work with than it being too short for that machine just so it can work with another machine most people who get it will likely never really use it on (especially once they see how crap the NES games look on the VC anyway). What a stupid decision on Nintendo's part imo. Here's hoping the do things the other way around with the SNES Classic Edition/Mini. And, just to show how much of a total "genius" I must surely be: How about making the controller around three times as long by default on the SNES Classic Edition/Mini but with a simple "snap" connecter about 1/3rd of the way along the cord (from the controller's end) so you can pull it out and make the cord much shorter if you want to plug it into the Wiimote to use on the Wii/Wii U VC? Also, that "snap" connector would also work in the case of someone accidentally pulling or tripping on the controller cord, where it would simply snap apart like the old/original Xbox controllers did (don't know if they still do). I mean, I'm no rocket scientist and I came up with that potential solution in less than a minute. In other words, emuboy85 probably has no idea what they're talking about. @PlywoodStick Everything high speed digital interface will eventually fail with a long enough cord. I had in my box three six foot NES extension cables, two six foot SNES cables, and a set of two SNES<->NES conversion patch cables I fabricated from the loose ends (one fits NES controllers to an SNES plug; the other fits SNES controllers to an NES plug). All Retrobit brand. Connecting all seven cables end to end, I got 42 feet of extensions before my SNES controller stopped working, 50 feet counting the 8-foot cord on the stock SNES controller. Remove any one cable and with six extensions the controllers still worked, but always failed at seven extension lenths. I am unsure if the controller failure was the result of stray capacitance, series resistance, or propagation delay, all of which would increase in proportion to the cable length. I have seen where extensions can cause failure long before that however. The Turbografx Turbo Tap has an 8-pin DIN connector with a one-and-a-half foot cord on it. The controllers themselves were about 3-4 feet, but I have a 12 foot 8-pin-DIN shielded extension cable that I bought on eBay to use with the controllers. The Turbotap completely fails to operate with the 12 foot cable between the console and tap, and I've heard reports online that the 6 foot extensions or Duo<->Turbo converter cables also fail. So the Turbo Tap absolutely will not function with a cable longer than six feet or so. I can still attach as 12 feet or more of extensions between the controller and tap, only nothing can be between the tap and the console. Why I have no idea as the communications protocol used in these retro controllers is fairly slow compared to modern high speed standards like USB, Ethernet, or HDMI. So it's not beyond the realm of possibility that the Wiimote standard has some maximum cable length due to stray capacitance, series resistance, or propagation delay, but users who bought the third party extension cables reported controllers working flawlessly with them, only that the retention clip needs to be removed for two player use. It could be the official spec dictates a maximum controller length, but in practice exceeding this length by running out-of-spec cables may still achieve a reliable connection, and we do have many first hand reports confirming that the extensions do in fact work as advertised. Not gonna lie, bought a 6 foot extension cord and I have zero latency. The games run as flawless as it did with the 30 inch cord. So I just think it was to get you sitting on the floor in front of the tv like the days of old. @ReshiramZekrom OR! They could have made it a Wii U/3DS release.